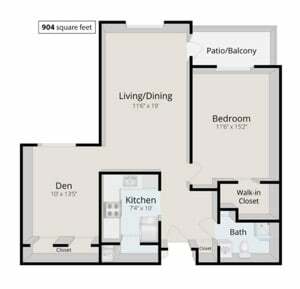 As one of several of our well-designed apartment homes available, the Durham floor plan at Meadowood offers an excellent balance of space and convenience. This welcoming residence, which is slightly more than 900 square feet, includes a roomy bedroom, an inviting living area, a flexible den and a contemporary kitchen. When you enter the Durham’s door, you’ll first notice how the main hallway smoothly expands into the living area, creating a naturally inviting home. Moving through the spacious entryway, you’ll see the modern kitchen to the left. The highlight of the Durham residence, however, is the spacious living and dining area, which works perfectly in the center of the home. With space to dine, entertain and more, you’ll probably find yourself spending most of your time in this room if you’re not out enjoying an activity, event or delightful meal at Meadowood. With the living area’s large picture window and access to the home’s attached patio or balcony, you’ll also enjoy picturesque views of Meadowood’s 131-acre, park-like campus. Connected to the living area is one of the most convenient features of the Durham home, the versatile den space. With its generous size, the den can function as an office or a study, while also providing space for an extra bed for your guests. The den also features a large window to allow sunlight to soak the space and a double-doored closet for functional storage. When it’s time to relax and rest, the bedroom in the Durham has all the space and comfort you could need. Like the living area, the bedroom boasts a large picture window, which lets natural light warm the room, and lets you rise in the morning and retire at night with serene campus views. To make life easy, the Durham’s bedroom also has a large walk-in closet with plenty of room for clothes for any season or style. Another aspect about the Durham residence that simplifies and enhances your lifestyle is that it (and the other apartments) has quick access to community dining options and activities all via indoor walkways. So while you’ll find a comfortable home inside the Durham, it’s also a residence that makes it easy to stay connected! Finally, the Durham residence lets you bring your personal style to your new home. You can choose your preferred paint colors, flooring, kitchen and bath options, and more – all to make your home uniquely your own. If you’d like to visit for a tour of the Durham residence at Meadowood, we’d love to host you. Get in touch by simply clicking here, or call us at 610-584-1000!